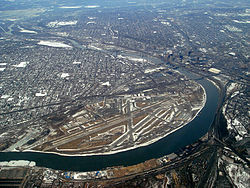 St. Paul Downtown Airport (IATA: STP, ICAO: KSTP, FAA LID: STP), also known as Holman Field, is an airport just across the Mississippi River from downtown Saint Paul, Minnesota. It is one of several reliever airports in the Twin Cities operated by the Metropolitan Airports Commission. The airport has three runways and serves aircraft operated by corporations in the local area, a flight training school and the Minnesota Army National Guard aviation unit, as well as transient general aviation aircraft. The airport is home to an installation of the Minnesota Army National Guard. The Holman Field Administration Building was added to the National Register of Historic Places in 1991. Holman Field was named for Charles W. "Speed" Holman (born in 1898), who was a stunt pilot, barnstormer, wing walker, parachutist, airmail pilot, aviation record holder and airline pilot. Born in Bloomington, he was the first pilot hired by Northwest Airways in 1926. In 1928, Holman set a world's record of 1,433 consecutive loops in an airplane in five hours over the St. Paul Airport. He died in an accident during an air show in Omaha in 1931 at the age of 32. During World War II, Northwest Airlines employed up to 5,000 people at the site, modifying new B-24 Liberator bombers, some of which received the highly classified H2X radar, which proved to be an invaluable tool in the European theater. The terminal was used as a backdrop for scenes in the 1972 film Slaughterhouse-Five. During the 1970s and early 1980s, commuter airline Lake State Airways offered scheduled airline service between the St. Paul Downtown Airport and Minneapolis–St. Paul International Airport in Minnesota. It cost $5USD for a one-way ticket between the two airports, and $10 round-trip. Capitol Air flew MDW-STP with a Swearingen Metroliner for roughly a year starting December 1993. St. Paul Downtown Holman Field covers an area of 540 acres (220 ha) which contains three asphalt paved runways: 14/32 measuring 6,491 x 150 ft (1,978 x 46 m), 13/31 measuring 4,004 x 150 ft (1,220 x 46 m) and 9/27 measuring 3,642 x 100 ft (1,110 x 30 m). For the 12-month period ending December 31, 2014, the airport had 66,475 aircraft operations, an average of 182 per day: 74% general aviation, 15% military and 11% air taxi. In January 2017, there were 68 aircraft based at this airport: 20 single-engine, 12 multi-engine, 18 jet, 7 helicopter and 11 military. Recently local debate has ensued over plans to build a flood wall around the airport. 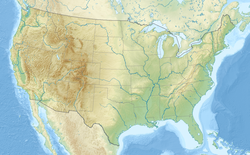 In 1993, 1997, and 2001, the airport was flooded due to its proximity to the Mississippi River. Supporters do not want to deal with the future inconvenience of having to deal with the flood again, while critics say that the proposed wall would ruin views and make the airport "ugly". A dike to protect the airport from the nearby river was considered since the National Guard stated that they may leave if the dike is not constructed in a timely manner. In 2009, a removable flood wall was installed that is only erected when flooding is imminent, leaving the views of the river intact for the rest of the year. Steel plates are embedded in the concrete on the river side of the runways. The flood wall is composed of steel posts that anchor to the embedded plates and aluminum planks that are stacked between the posts to form a flood barrier. These are then removed and stored when the flood event has passed. ^ a b c FAA Airport Master Record for STP (Form 5010 PDF), effective Jan 5, 2017. ^ (nd) Ask A Historian Archived 2012-06-03 at the Wayback Machine. Ramsey County Historical Society. Retrieved 5/31/07. ^ Kenney, Dave (2004). 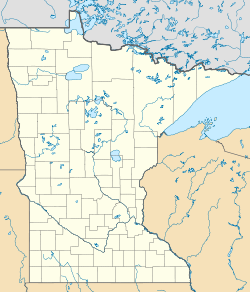 Minnesota Goes to War - The Home front During World War II. Minnesota Historical Society Press. ISBN 978-0-87351-506-1. Retrieved 2008-01-30. ^ Helms, Marisa (2006-04-05). "Airport flood project stirs the waters in St. Paul". Minnesota Public Radio. Retrieved 2008-01-30. This page was last edited on 6 February 2019, at 23:43 (UTC).